Yes, the $32 million, 28-month reconstruction of Alton Road has begun. And yes, getting the Florida Department of Transportation to change direction on a plan bid and begun may be impossible. A quick look at the Coalition plan. 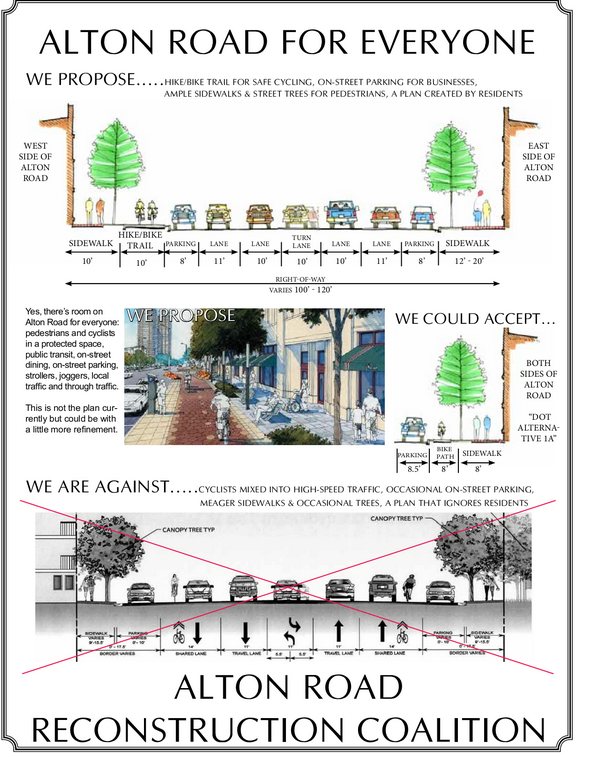 But….a group called the Alton Road Reconstruction Coalition has assembled a thoughtful ploposal for rebuilding Alton Road to accommodate pedestrians, bikers and commuters with a concept that promotes good air and green space. The folks behind the plan, led by a group of neighborhood associations, advocate for wider sidewalks, a hike and bike trail on the west side of Alton, a lower Alton Road speed limit and narrower lanes to slow traffic, more shade trees and a center median. The coalition Facebook page lists a series of public meetings to make the case, including a May 22 Miami Beach Land Use meeting where a lower speed limit (30mph instead of 35) will be pitched. There’s also a coalition meeting Wednesday at 6:30 p.m. at the Seymour, 945 Pennsylvania. The coalition website outlines the plan in detail — what looks right in the FDOT plan and what doesn’t. So yes, construction has begun. Can the course of action be changed? This entry was posted in City Issues, Development, Traffic and tagged Alton Road, Alton Road Reconstruction Coalition, FDOT, Transit Miami. Bookmark the permalink. The May 22nd Land Use Meeting has been cancelled. The discussion has been moved to the June meeting. The item will be discussed at the Monday May 20th Neighborhoods Meeting, the meeting begins at 3PM, as yet there is no time certain for the Alton Road discussion.